Could Toronto be built on top of an ancient alien city? The article that started it all. Click for a zoomed-in view. One of the stranger stories to come out of Toronto has to do with something that supposedly took place in August 1978. Sometime during that month, according to the tale, a Torontonian searching for a lost cat ventured into a tunnel and encountered something terrifying. We all know the downtown PATH system: 28 kilometres of climate-controlled underground walkways and shopping. But what if we told you that Toronto has another buried city, also populated by pale wizened troglodytes who rarely emerge to see the light of day? The person who went searching for the missing cat on that hot summer day was a 51-year-old man only identified only as “Ernest.” Flashlight in hand, he crawled into a small opening near his apartment building on Parliament Street and found himself in a low tunnel. Here, the story gets strange. 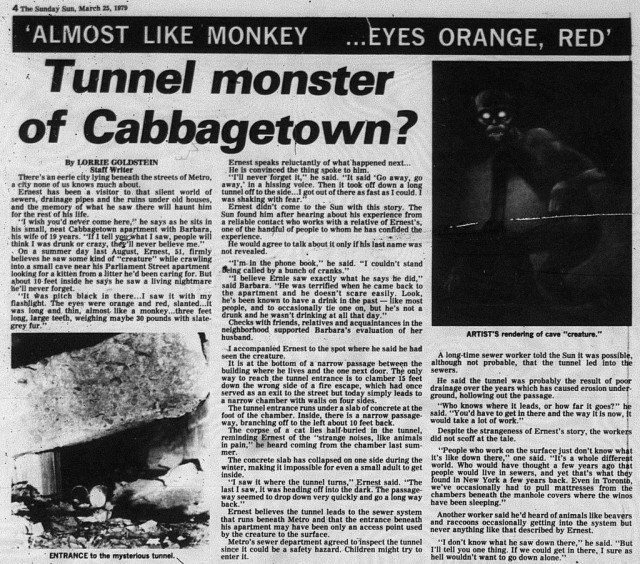 As reported by the Toronto Sun in March 1979, about ten feet into the tunnel Ernest spotted a thin human-like figure some three feet tall, with grey fur and slanted, orange-red eyes. The creature looked at him and hissed the words, “Get out, get out,” before fleeing down a side tunnel. Ernest, not surprisingly, took off in the direction from which he’d come. So what did Ernest see? It’s possible he was drunk or hallucinating or lying, although the way the article is written seems to suggest that Lorrie Goldstein, the reporter who interviewed him, didn’t think so. Maybe the so-called “Tunnel Monster” was just a raccoon or another mundane animal, its fearsomeness amplified by darkness and claustrophobia. Or maybe it was an escaped monkey; those things can turn up anywhere. We’ll likely never know what really happened. When the story was originally reported by the Sun, the entrance to the tunnel had already been effectively blocked off by collapsing concrete. Goldstein no longer remembers where the opening was. And with only a 34-year-old newspaper story to go on, the location is virtually impossible to pinpoint now. There have been no subsequent sightings, or at least none that have been reported publicly. Fortunately for all you aficionados of the unexplained, there’s more. Bizarre as Ernest’s tale is, it’s just the tip of the weirdness iceberg. There is a small opening to the underground tunnels off Parliament Street in downtown Toronto. (The entrance is between two apartment buildings, and leads to the tunnels via the sewers.) The underground city (abandoned?) beneath Toronto has its center beneath Gerrard Street and Church Street. Above this area, strange magnetic effects have been observed. (Note: This corner of Gerrard & Church streets has a higher accident rate than anywhere else in Toronto. It is believed that underground equipment utilizing powerful magnetic fields (which have caused many strange magnetic effects in houses near this intersection) are responsible for the bizarre equipment failures that often are the cause of these accidents. Could the Tunnel Monster be a resident of this now-ruined city—perhaps a degenerate descendant of its builders? Could be. Sadly, however, the Commander’s surprising claim lacks real-world credibility (although it may explain why neo-Nazi whackjob and hollow-earth enthusiast Ernst Zündel lived nearby on Carlton Street before being booted out of the country in 2005). 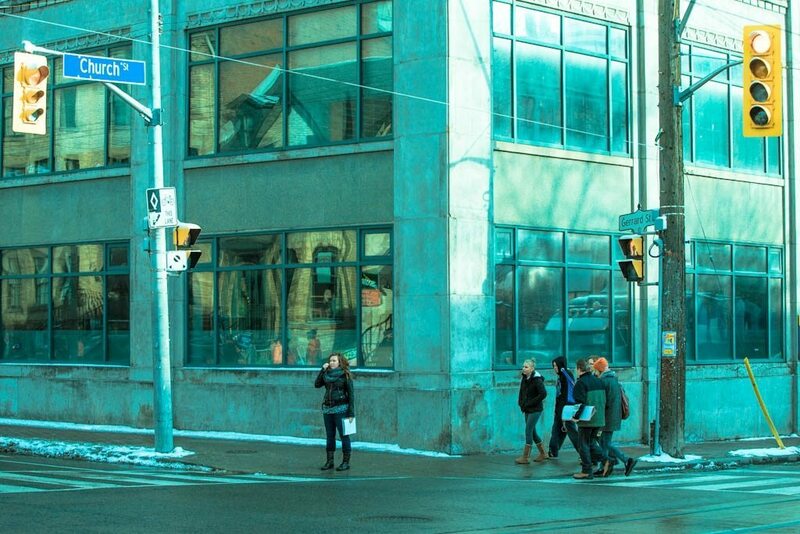 There is no independent evidence of “strange magnetic effects” in the area, and a study last year from Global News showed that far from being an automotive Bermuda Triangle, Church and Gerrard is actually one of the safer intersections in the GTA. There are more obvious practical problems with the idea of a buried city right under our feet, notably that every time work crews dug up roads or laid building foundations, they’d risk scooping up backhoe loads of squinting, hissing homunculi. All things considered, there’s probably not a colony of Morlocks camping out underneath Toronto. But the tunnel monster remains a mystery—food for thought next time you’re waiting alone on a subway platform at night. Thanks to Lorrie Goldstein and the Toronto Sun.